Remember Quincy M.E.? It was a very popular crime show starring Jack Klugman which ran for 8 sesaons on American television from 1976 - 1983. Quincy was a Los Angeles County medical examiner who went about solving mysteries much to the consternation of the cops of the homicide division. Quincy M.E. was the first of the CSI type shows - the first of its kind, really. I can't remember another show then which took us to the morgue weekly. 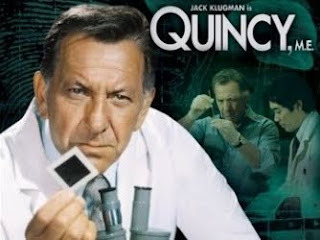 Jack Klugman was his usual irascible self in the starring role of the divorced medical examiner who was always bucking his boss and a department too eager to okay a body's release when it was obvious - at least to Quincy - that something was amiss. I think this was Klugman's next television show after having starred for years in THE ODD COUPLE with Tony Randall. (Another favorite of mine.) It was a revelation for me to see Klugman appearing in a medical mystery drama dealing with dead bodies on slabs at the morgue after watching him play Oscar Madison for laughs. But it didn't take long for him to convince me that he could do anything. Read more about Quincy, M.E., here. The shows are currently available on dvd and for viewing on Netflix. Good news. This is my entry in the Crime Fiction Alphabet 2011 Weekly Meme hosted by Kerrie Smith at her blog, MYSTERIES IN PARADISE. Check out this link to see the other Letter Q entries. Yvette - Oh, my goodness, I used to watch this show!! So nice to be reminded of it :-). A very clever choice for "Q," too. I used to love QUINCY as a kid and the main reason had nothing to do with discovering what a sub subdural hematoma was or how to perform a tracheotomy using a ballpoint pen - but rather it was the fact that he always fought on the side of the underprivileged and raged tirelessly against those who abused their position of power - as a teenager that was a real hook - power to the people Quince! I loved watching this show when I was growing up! We got it through Netflix a little while ago and I found that, while I still loved it in small doses, it didn't go down so well watching 4-5 episodes (however many are on a disc) in a row. Watching in marathon sessions made me think how formulaic the episodes were--not something you notice when you have to wait a whole week to watch the next one. I loved this show and Jack Klugman as Quincy, and watched it all of the time. Yes, he did buck the system and help many who wouldn't have gotten help without him. Great show! I actually forgot about this show. I remember loving it, but not sure how much I would like it now. I'm not a big fan of all the CSI shows. Margot: Thanks! These days it seems as if half the time I live too much in the past. I was a big fan of Quincy too. The show just popped into my head when I was thinking - Q? Bev: That's the problem with watching almost any show, I think, in bunches. They really weren't meant to be seen this way. Well, you could watch one a week. There's no law says you have to see them all together. Ha! I own the last two seasons of THE WEST WING and I have to say those hold up to being watched in a bunch, especially the last year which I loved - with Jimmy Smits. Kathy: I thought I had forgotten the show, but when the Letter Q came in the Crime Fiction Alphabet meme - this long-ago show just seemed perfect. I remember it was a terrific show. Klugman on one of his tirades was always fun to watch. Ryan: I'm SO NOT a fan of the CSI shows. But QUINCY didn't concentrate on gore. But I must admit, it was the first of its kind. No question. I love Jimmy Smits, one of my favorite contemporary male actors. I liked his show "Outlaw," and was furious/disappointed when it was taken off the air after only a few episodes were shown. My Dad's favorite show. I can't help but think of him whenever someone mentions "Quincy." We had a huge original Broadway cast album collection in our house when I was growing up. Never found out who the musical fan was in the house, though. One day while looking them over I was astonished to see Jack Klugman's name on the album cover for GYPSY! He was the original Herbie. I think he played him in the movie, too. Later when I was addicted to the old "Twilight Zone" reruns on Channel 11 I was even more surprised to see Klugman doing an impressive job as the guy with the horn who inherits Gabriel's job. He was definitely more than just Oscar Madison which is what most people remember him for. I'll remember him as Madison and Quincy. Hmmm, those names seem to have a historical tint. A lot of the older actors began in theater. I'm not surprised to find that Klugman did also. He did plenty of drama. Didn't he also star in some production of 12 Angry Men sometime? My daughter was so surprised to find that Jerry Ohrbach, her favorite character from LAW AND ORDER, began as a singer and hoofer on Broadway. He was the voice of the candleabra in BEAUTY AND THE BEAST - surprise! Quincy was very different from the CSI shows, which seem to feature sensationalist, sadistic crimes and gory, bloody cadavers. And high-tech methods of detecting criminals. It's not about personalities or human issues or sympathy or understanding. I can't watch them. However, Quincy wasn't like that. It was about the medical or criminal mystery of what happened to the corpse. It was the adventure, the puzzle, and Quincy's (or Jack Klugman's) personality, his opinions, his sense of right, his humanity. The current CSI shows don't do this at all. Kathy: You're right, of course. I don't watch today's CSI shows - they've just gotten too gory and sensationalistic. In the first year, CSI (the first one) debuted, it was a good show, but then it started to to try and top itself every week. Yuck. But Quincy was the first, and the reason I say that is that we had never had a show on TV with a medical examiner as the protagonist. We had never seen the behind the scenes of what goes on - theoretically - at the morgue. They did show bodies on Quincy, he did conduct autopsies, they just didn't dwell on it and they didn't show close-ups of the gore. Quincy had way more humanity in his little finger than those characters in today's CSI shows. I think Fred always said that Eleanor Powell was the best dancer he ever worked with. They are a joy together. Yes! Well said. Quincy had more humanity (and human understanding) in his little finger than all of the CSI characters put together. None of them are characters we laud or cheer on, as we did with Quincy. And we learned about issues. A few more layers were unpeeled about the human condition. Not so with the CSI shows at all. Nor do I, not even for a second changing channels.